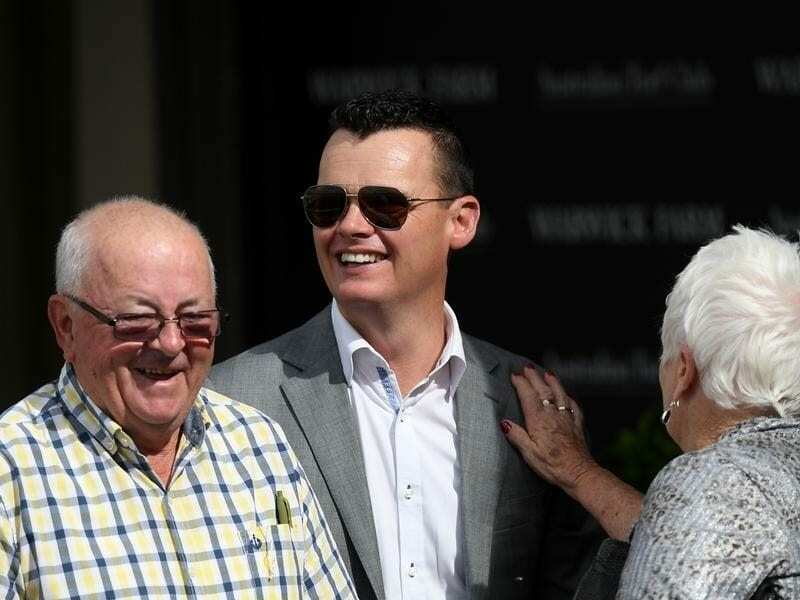 Trainer Joe Pride (centre) hopes Pecans performs well at Warwick Farm to earn a trip to Gosford. Joe Pride has mapped out a return to black-type racing for former Godolphin mare Pecans as she seeks to prolong an impressive first preparation for her new trainer. The four-year-old had her last start for Godolphin’s Australian operation in May and returned to racing for the Warwick Farm-based Pride in November. Pecans has two wins from three starts for Pride and providing she runs well in Saturday’s Australian Turf Club Handicap (1400m), she will back up in the Group Three Belle Of The Turf Stakes (1600m) at Gosford. Her only other black-type start was in last year’s Listed Reginald Allen Quality (1400m) in which she ran fourth for trainer John O’Shea. “I took her for a test-run up there (Gosford) second-up and she won quite well,” Pride said. Pride was delighted to acquire Pecans and said she had thrived in a smaller-scale stable. “Maybe she slipped through the cracks of a big system. We can give more personalised attention and she seems to be in the right zone,” he said. Pride said Ticked, another mare who started her racing at Godolphin, was also showing positive signs for the stable. Ticked secured her first win for Pride at Hawkesbury over 1800m earlier this month, an effort that gave the trainer confidence as she prepares for Saturday’s ATC Owners Benefit Card Handicap (2100m). “Hawkesbury was the first time we tested her stamina in any way and she came through that really well,” Pride said.